For weeks now I have been planning a Chicago Taco Adventure. Realizing that there are no good tacos in Evanston, I now must venture into parts of Chicago to get my taco fix. This adventure is still in the planning stages, so I was very excited (and surprised) when I came across tacos at the Lincoln Park Zoo. After observing polar bears, meerkats, penguins, flamingos, lions, leopards, and monkeys enjoy their dinner my stomach was growling for some food of my own. At first I was hesitant to go into the usually over-priced tourist trap food court, but the sign pointing the direction to the entrance was very enticing. 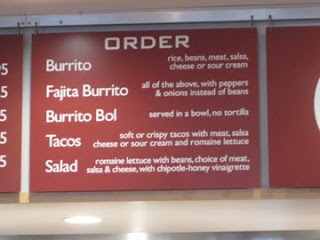 It listed the cuisines available in the food court and immediately "Mexican" caught my eye. I rushed in and jumped in line to get my tacos. I do not like Chipotle. I never have. And that was even before eating there. My biggest gripe with the Mexican-style chain restaurant is I believe it drove Burritoville, a NY-only more authentic version of Chipotle, out of business. Despite my feelings against Chipotle, I let me friends Samantha and Lisa convince me to try it. They are Chipotle fanatics. They crave Chipotle the way I crave Mexican food -- always. After a disappointing Northwestern University football game, I walked with Samantha and Lisa to Chipotle to see what all the hype was about. Carnitas have become a favorite taco flavor of mine throughout this journey, so I decided to continue the tradition and perhaps add another favorite carnitas taco joint to my list. I have decided I need to take the "only hard corn tortilla shell" sign as a warning.